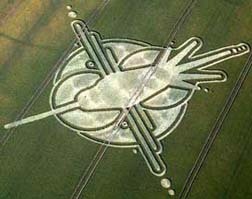 Top: “Nazca Bird” reported July 2, 2009, below Milk Hill near Stanton St. Bernard, Wiltshire, England. Aerial image © 2009 by D. Grove. 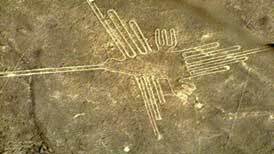 Bottom: Hummingbird on Plains of Nazca (500 B. C. to 500 A. D.), 250 miles south of Lima, Peru. Aerial image © Go2Peru.com. Images and information by: Cropcircleconnector.